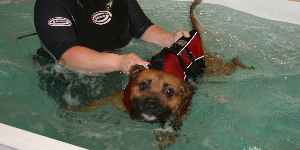 Our Hydrotherapy Centre is fully equipped for all your Canine Hydrotherapy needs. The heated pool (also fitted with hydro-jets to increase difficulty as required) and the Hydrotherapy Underwater Treadmill covers a wide range of injuries, relieves pain and aids recovery. Suffolk Canine Country Club is a full member of the National Association of Registered Canine Hydrotherapists (NARCH), for which we agree to abide by the accepted standards and code of practice. 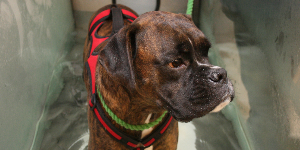 As a registered member of the NARCH, we are recognised by major Pet Insurance companies, for which hydrotherapy treatment is covered in their policy. Please contact your insurance company to confirm your pet insurance policy covers hydrotherapy for your beloved pet . All Hydrotherapy treatment is booked on a Vet referral basis only, to ensure that your dog is fit and well enough to proceed. We will stay in contact with your vet for the duration of treatment providing regular written feed back. For a VETERINARY REFERRAL FORM for your vet, please download this form HERE.